Federal Shipbuilding & Dry Dock Co. at Kearny, New Jersey looking west in 1945. 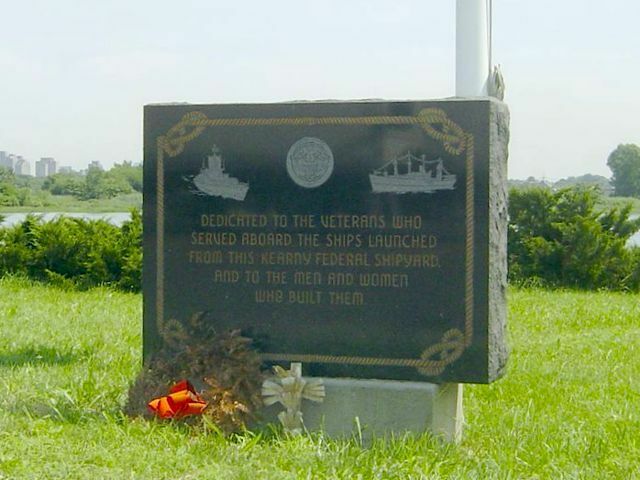 Federal Shipbuilding & Dry Dock Co. was originally located at Kearny Point, Kearny, New Jersey on the west bank of the Hackensack River, about three miles from today’s Newark International Airport. A subsidiary of United States Steel Corporation, it was organized in 1917 for the construction of steel ocean-going vessels. From 1930 through the last of the Gearing class, Federal built more destroyers than any other builder except Bath Iron Works, including the lead ships of the Somers, Benham, Fletcher, Allen M. Sumner and Gearing classes. Federal’s Gearings were built at a separate facility, completed during the war, at Port Newark, New Jersey. Federal, Kearny from the air in 1945 and from the ground in 2003. Concurrently, Federal also built other types, including cruisers and merchant ships. In such a large operation, even different destroyer classes were under construction at the same time, as reflected in the mingling of commissioning dates for Gleaves- and Fletcher-class ships. Shortest time from keel laying to launch was achieved with Melvin, at 103 days. Shortest launch-to-commission was set with Thorn at 21 days, as was the yard’s record for keel laid to commissioning at 137 days.